Acknowledged by those who flew it as the best of the 109 series, the Bf-109F was the result of trying to smooth out the edges of the earlier variants. This meant a refined forward cowling for the DB601 engine and more smooth and rounded wing tips along with shorter ailerons, the result of the increased size of the coolant radiators under the wings and the need to exhaust them at the trailing edge. The F model also did away with the wing guns, relying on two 7.7mm nose machine guns and a 15, later 20mm nose cannon, though most pilots thought the plane was underarmed, but did like the additional maneuverability afforded by not having the weight of guns and ammunition in the wings. The aircraft first started coming off the assembly line in late 1940, entering service in early 1941, where it was an unpleasant surprise to the British as this new Messerschmitt was pretty well superior to the Spitfire V then in service in most regimes. The best variant, the 109F-4 entered unit service in early 1942 where it gave sterling service until pretty well supplanted in most units by the G model by the end of the year. Early on it was recognized that standard bombers were not going to be successful in all types of tactical use. The thought was then given to develop the fighter-bomber by attaching a bomb rack to the underside of 109Es in place of the drop tank. This became quite successful and most Luftwaffe fighter wings had dedicated fighter-bomber squadrons. These aircraft were used initially in hit and run raids on British shipping in the Channel or against highly defended targets. 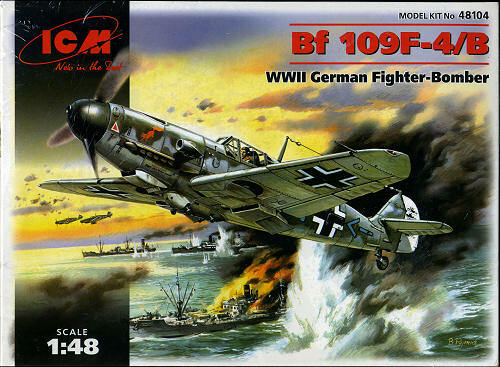 This is, fourth boxing of the 109F-4 done by ICM since this kit was originally issued. There has been much talk about ICM copying other kits and many may think that this one is little more than a copy of the Hasegawa kit. That is definitely not the case. While there are similarities between all kits of similar aircraft, this one bears little that appears to be in common with the Japanese offering. I should also mention that this kit has been selling very well in the US, selling out quickly whenever it appears on store shelves. ICM has continued using resealable parts bags and I find this to be a huge boon to keeping all the bits around once the box is opened. Once open, one finds the usual basic sprues that seem to be in every 109F kit. It also includes a weapons sprue that is no in previous kits. 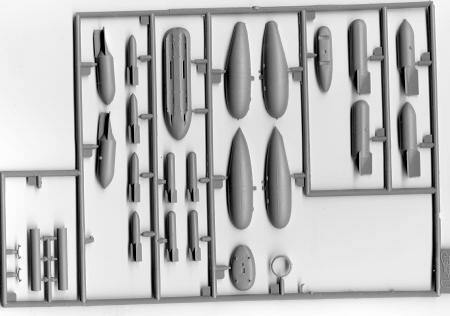 This sprue has two bomb racks, a pair of drop tanks and a selection of bombs for those racks. The clear sprue contains the three canopy sections and an armored windscreen addition and gun sight. These are very well molded though I do admit to seeing stress marks in all the panes. The rest of the kit is well molded with nicely done engraved plastic. Perhaps not as thin and crisply done as Hasegawa, but certainly darn close to it and enough to please all but the most fastidious of builders. I did find that some of the parts had a bit of flash, some had openings flashed over and the wheels had some very minor sink areas on the back. Some parts have ejector pin marks on them, but from what I've noticed, they are all on the 'inside' and can be easily removed if one wishes. The surface is also a bit on the 'pebbly' side, especially with the wings. This is generally not a problem and disappears under paint. OK, so what sets this one apart from other 1/48th 109s. Well, the biggie is the engine. As with their Spitfires, ICM has provided a full engine with this kit. It is fairly well done and while not at the detail level of a resin replacement, is nevertheless a nicely detailed one. This means that the forward fuselage is in several sections, complicating construction somewhat. Most of us will probably not build it with the cowling off and from what I have heard, closing the cowling is not an easy task. Perhaps just installing the block as a mount for the exhaust and prop will be the fix as it was with the Spitfire. The kit provides a complete interior with seat, stick, rudder pedals and so on. There is also side panel detail . A separate rudder is provided, though it appears that it cannot really be made to sit at an angle without some additional work. the kit also provides separate wing tips. Not sure what is to be gained from this as I'd personally prefer them to be part of one of the wing sections to keep there from being alignment problems. Flaps are separate, though again, it appears they are designed to be in the neutral position. One also has separate upper and lower radiator coolant doors. Again, it seems these can only be mounted in the neutral position. I'm not sure of the reason for offering these bits separately if one cannot have them in different positions. But I've not built it to find if this is true. Slats are also separate and since the travel of these is so small, putting them 'down' shouldn't be a problem. 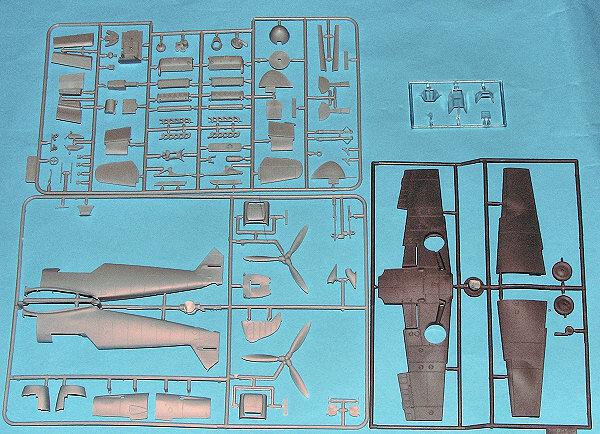 There are several additional bits on the sprues that are not used, such as a spare prop and another set of exhausts. Instructions are well done with 8 construction steps and colors by generic and Model Master references. On the back of the box is one painting option in full color (standard RLM 74/75/76), that being of the box art plane of 10. (Jabo)/JG 2 in France during 1942. Other similarly painted options are for 10. (Jabo)/JG 26 same time/place, 2./JG 51 in Russia during mid 1942 (yellow wing tip and cowling undersides and fuselage band), and a white winter scheme plane of 1./JG 54. ICM has started providing RLM numbers to the appropriate paints so apparently they have been listening to modelers. also provide RLM shades where they are appropriate. Decals are well printed though there is a bit of registration shift with the white parts of the insignia and multi-color markings so some trimming will be needed prior to use. There are also a ton of aftermarket decals for the 109F so replacements shouldn't be a problem. So there you have it. 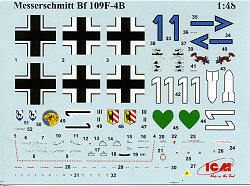 Another option to 'where can I find a nice 1/48 Bf-109F kit' question. I don't doubt that this will be a bit of a fiddly build in some areas, but overall, it seems to be pretty straight-forward and for those who want the additional detail of a full engine, you now have it. My thanks to www.dragonmodelsusa.com for the review kit. You can find this either on their webstore or from your favorite hobby shop.